Well now I will start to write about guitar technique and music. I love to talk about music even more if it is about classical guitar. I usually teach every day for several hours while I practice – this means the following: When I practice repertoire I discuss all the details that I can think of with my Ghost-Student. He is patient and eager to learn, so sometimes I can explain very complex matter for over one hour and my Ghost-Student is always very focused. Of course we know that this type of students are very rare but for me it is very helpful in order to look deeper into the music and of course talk about technical issues. Well…..my wife tells me that I am crazy, because when she passes by my studio window I talk very enthusiastic and with gestures to my non-present student. Of course this might look odd and crazy for somebody out of the music world. In these days my wife got used to the fact that I teach alone and talk to myself. After my last concert tour in the USA one student came up with the idea of a Blog, since what I teach is helpful and students love the challenge for improvement. Well, after few days of learning about WordPress Blogs, and crashing several times my web page, I finally get to write – without pulling my hairs when the page is not working again. Now, I was thinking on a first topic for the Blog. Everybody says that the first presentation counts most in order to maintain people interested. This means that I will talk about the TREMOLO. For this I want to thank all the students from University of North Texas/Denton and specially to Prof. Thompson. The planed 45min. master class went for over 4 hours without a break…and yes, all the students where very focused and participated and applied all the new technical stuff I showed to them. That said, I have to clarify that my point of view and exercises are not thought to be for beginners. But teachers could incorporate some of the basic ideas in the process and take them step by step to a higher level. Most of the young guitar players get really exited when it comes to the Tremolo technique. Tremolo is a very unique technique for the guitar, and most musicians and of course the audience are usually very impressed by this wonderful sound effect. There are so many ideas on how to practice the Tremolo, that you could actually write a separate article just on the different methods. I believe we need first to understand what actually the Tremolo is, before we take the guitar in our hands. The Tremolo is an acoustical effect that tricks the ear, and this is actually quiet simple – so it fits perfect for my first post. When you hear a tremolo piece you are impressed by the continuous sounding upper line. Together with the thumb it creates the impression like two instruments performing together. Musically speaking the ear follows the upper line and it sounds like 4 notes flowing over the baseline. But of course we know this is not the case. There are 3 attacks for the upper line, after the thumb attack. The Flamenco style has 4 Attacks. Well so far there is nothing new…right? But if you have 3 attacks and the thumb attacks in between why does it sound as a continuous line? Well, the ear hears 3 notes and one that is hidden behind the thumb, so the thumb is responsible for the coverup of the 4th note in the upper line! You have to let the 3rd note of the tremolo ring over the thumb attack creating a “tide note”. The upper system is the usual writing of the Tremolo (in this case it is the beginning of “Recuerdos de Alhambra” by Tarrega). The second system shows what your ears are actually hearing. There is a tied note sounding behind the thumb attack. Now the hard part is of course to connect the line, because we learn the piece from the very beginning as it should be played with several chords – placing and changing all fingers together as a chord and this creates always a gap in the Tremolo line. You can see in the second system at end of the measure the spot where you have to anticipate the change of the 1st, 2nd and 3rd finger, but the 4th finger stays just a little longer creating the tied note. This means that your fingers have to become independent from each other and try to follow the idea of the music! The thing of the “tied note” is of course not always possible. Specially when you have big jumps, but most of the time it is always possible to create a separate movement of the fingers keeping the finger who has the tremolo note planted as long as possible in order to create the tied note. When you have big jumps or very awkward changes there is no chance you can apply the anticipation idea, but then you have to cover up the moment with a full sound of the thumb attack, so that the ear does to realises that there was a gap in the tremolo line. The best example for this is when you observe Celin Romero or Pepe Romero performing the Tremolo. I am privileged to have studied with Celin Romero in Del Mar/San Diego; but you can watch videos of Pepe Romero performing Tremolo technique. You can see very clearly that he uses nearly always the “Apoyado”-attack for the thumb. This gives the lower line a full sound and covers up the little gap of sound in the tremolo line – when you are not able to connect the tremolo holding the “tied note”. So for me the big difference between “Recuerdos de la Alhambra” by Tarrega and “Una limosna por el Amor de Dios” by Barrios is not that Barrios uses mostly the high E-string for the Tremolo….. (there shouldn’t be a difference on what string you play the Tremolo – I will talk another time about this topic). 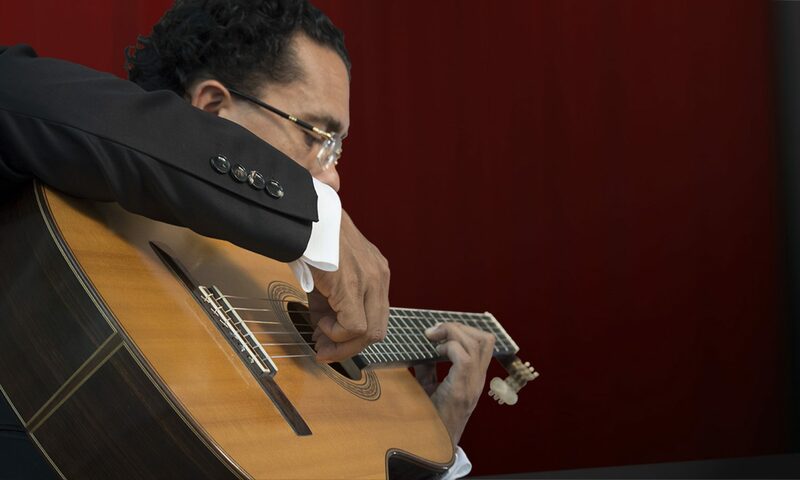 The problem is that Barrios makes large jumps over the fretboard and this makes it impossible to apply the anticipation idea for the upper line in order to maintain the “tied note”. I try as much as possible to use the anticipation but when you have big changes of position you have to focus on the thumb – the thumb has all the responsibility in order to coverup the gap in the Tremolo line that are created by the big changes. Thus you have to be able to perform the Tremolo playing the thumb with “Apoyado” technique. There is lots of discussions out there about the placement of the p- or a-finger in the Tremolo…. which finger has to be placed first. Well, I guess this discussion is solved, because if you place the a-finger to early – either before or together with the thumb – you cut off the sound of the Tremolo line – you loose the tied note! This is of course not everything about Tremolo but it is a start. I hope I could add some little technical knowledge to your Tremolo technique. Finger Training tips in order to have a even attack of the Tremolo, no matter what speed you perform in. Previous PostPrevious Hello everybody who loves the guitar and practices for hours! Next PostNext Sitting posture has to be as relaxing as possible..and not causing fatigue! In January/February on concert tour in Bolivia. After years of performance and practice I think I can give back some helpful tips and tricks in order to maintain the guitar technique always improving. And also to give some thoughts about the guitar interpretation and music.